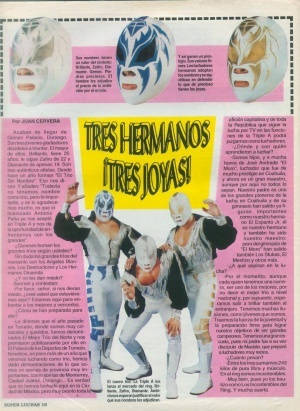 They were similar to the popular CMLL trio known as Los Metálicos. The Metalicos were known nationally first, though Los Gemas del Ring may have been using their look first locally. The high-flying Gemas lost their masks and hair in the span of two weeks during July 1995 and were never heard from again, nationally. Instead, they went back to La Laguna area. Zafiro got his mask back around late 90´s and wrestles as a middle carder and some times as a mini. Diamante, older than Zaifro despite the information AAA gave, changed his name to Moro III in early 2000. Brillante had a short retirement between 2000 and 2002, and helped train his son, La Sombra. Diamante is now working as a trainer at Gym El Ranchero, where area wrestlers such as Ultimo Guerrero, Stuka Jr., and La Sombra have started. Diamante also know as Morro III occasionally wrestles in at a training capacity or in special cards. Brillante is back from some years of retirement in early 2000´s and wrestles around the main events. In the summer of 2008, Las Gemas took over Gym El Ranchero. Diamante, Pentagoncito (Zafiro), Brillante as well as Zafiro (II) took part in the training of hopeful youngster wanting to become wrestlers. Moro III became the head trainer, Pentagoncito the kids trainer, Brillante the women and bodybuilder trainer, with Zafiro (II) also a bodybuilder trainer. There are 2 Zafiros. One of them lost his mask, but it's unknown which wrestler it was. One Zafiro became Pentagoncito is now masked, and the other is another Moro family member who lost his hair to La Sombra and to Caballero Halcon. This page was last edited on 21 August 2009, at 13:39.